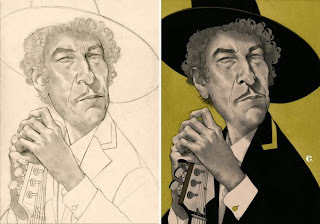 Edward Kinsella III's illustration of Bob Dylan that he created just for our email campaign several months ago graced the cover entrance to the Society of Illustrators this year for the Illustrators 54: Sequential-Series, Moving Image, and Uncommissioned category. We are proud to have our talented artist be front and center. For the blog that features all of the Bob Dylan illustrations that our illustrators did for that email, go here.